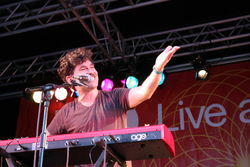 "Surprise Highlight of Womad 2011!" Sometimes you just don’t see it coming . . . If you’re like me, when you go to a major world music festival like Womad you prepare your list of ‘Absolute Unmissables’, ‘Really Want To Sees’ and “Wouldn’t Mind Seeing Thems’. This is usually more than enough to fill your available time. And you go away happy. But sometimes you take a chance on something you know nothing about at all. And like a ‘lucky dip’ or a £1 Scratchcard, you can suddenly find yourself unexpectedly rewarded . . .
And so it was with the Argentine composer and multi-instrumentalist, Axel Krygier. The Radio 3 Stage presenter Lopa Kothari introduced him as : “delirious, anarchic, a llama on acid - the King of Alternative Cool. Argentina’s New Renaissance Man, the Musical Explorer”. Well, I’ll have a pint of whatever she’s having - because that sounds just the brew for me. However, I must disagree with the one epithet: ‘The King of Alternative Cool’. Personally I’d have him down for the Emperor of Alternative Hot! Let me tell you - the man is on fire when he performs. Offstage he comes across as quiet, thoughtful, diffident and obliging; onstage it’s as if someone’s held a match in front of a blowtorch, Whooooof!! And you have to stand back for fear of being burned! His band is comprised of three other musicians besides himself - a tall, slim guitarist with sideburns, thick black plastic glasses and a pork-pie hat in a pale yellow shirt and dark brown tie - who bore a passing resemblance to the keyboardist in 70s synth-pop band Sparks, a hairy, bearded bass-player in bright green top and huge purple scarf and a young drummer all nonchalant and cool in stone-grey and red. They were probably French. They were certainly very competent. Axel himself came on stage - in faded black, like a blank backdrop - whistling like a songbird (a beautiful and strange experience in itself) and began dancing like a puppet to the sound of swirling organ. From that first instant he has your attention and you are a willing captive in his strange, anarchic world. Instantly, the crowd rushed to the front - it was as if magician Derren Brown had planted some mass crowd control trigger into their heads. And at that point you knew something special was going on. 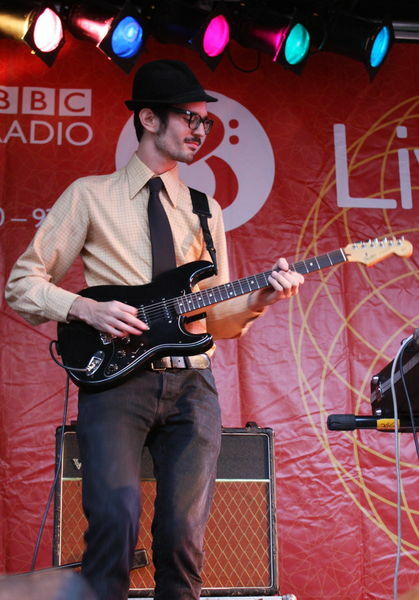 Nobody knew who he was or what kind of music they were going to hear or what at all to expect - and yet ‘the Axel Krygier experience’ was the only show in town for those who were lucky enough to be in the wonderful arboreal amphitheatre of the Radio 3 Stage. 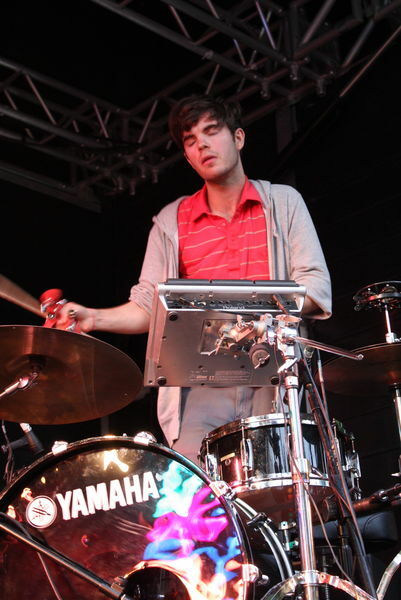 Krygier utilises a combination of Nord synthesiser and multiple loops, samples, speeches, weird vocal effects, pitch-bends, etc, etc, alongside flute, pocket trumpet and melodica. With these tools he constructs an elaborate artifice of sound and inner vision. In the track “Realidad Chromatica” (NB: I’m having to guess all the names of the tunes, based on chorus lines) he twists his voice electronically to stunning effect from slowed down bass octaves to sub-Pinky & Perky squeaks (for those of you old enough to remember them!) all within a matter of seconds. He also uses layered canned laughter to the best effect I’ve ever seen - ie to induce laughter, not to replace it. Physically, Axel is uncannily reminiscent of Charlie Chaplin with his curly brown hair, moustache and compact body, and he certainly has that same sense of comic timing and enough expressions flying across his face to encompass the whole human psyche in a few seconds. I’ve never seen so many personalities inside one human body. At times he was madness personified: gesticulating wildly, eyes rolling, singing, shouting, declaiming, dancing, leaping, doing star-jumps across the stage, running on the spot. At others he would just pause and hit you with a smile, that showed you he too was in on the joke. All his music teeters on the edge of anarchy and yet has an internal logic that speaks straight to our unconscious. Here’s someone that knows exactly what he’s doing and has the confidence and the balls to pull it off, ie let the audience come to you. How many artists would allow such pauses in their music - they’d be too afraid of losing the audience - but from little kids to old Womad crusties, everyone saw the joke and more importantly joined in! This guy is a consummate performer. He’s like a 21st century medicine man, but not a charlatan or mountebank, because his particular brand of Cure-All medicine really does work. Axel Krygier is curing the world a gig at a time. Book an appointment whilst you still can! “Sentimiento/Pensamiento” was another totally engrossing tune, delivered in a deliberately octaved-lowered deep voice. Axel graphically and disturbingly illustrating the words with a fist alternatively stabbed into his head and guts, punctuating the meanings of the song with action. Ok, Ok, I know. You still haven’t got a clue what the music was like. Well, what on earth can I say? It reminded me of elements of almost every style of music I’ve heard in my life - and at the same time, sounded like none of it. Axel Krygier is an amazing musical designer, but comes without a label. I could hear late 60s psychedelia, early 70s funk rock, 80s synth pop, Hammond flavoured jazz, Happy House, melodica-driven Dub, 70s Jethro Tull, storming 60s latin jazz and boogaloo, Middle Eastern and Arabic trance, cumbia, musica tropical, film noir, and… and… and you know what? I give up. "Axel Krygier is a musical sorcerer"
Don’t let the inability to force this music into a convenient world music category (or any category for that matter) put you off. Axel Krygier is a musical sorcerer and all the world’s musics are just ingredients to be ground in his electronic pestle and mortar before being transformed into gold inside his cerebral crucible. Fools’ Gold maybe, but all the more truthful for that. Axel Krygier directs his band like a demonic conductor - with furious energy, but also loveable and comic at the same time. The whole show he shifted effortlessly between English, Spanish and French; well, I say effortlessly, but he did occasionally forget he wasn’t in France when speaking to us. At one point the band piled into a really heavy latino-funk number (using pocket trumpet and flute) which had the whole of the R3 arena jumping and bopping as if there was some unavoidable magic force controlling them (it was that Derren Brown vibe again). Earlier he announced he was going to do a cumbia from Argentina (cumbia being an afro-latino style originally from the Caribbean coast of Colombia, but long since popular throughout the working-class communities of Latin America): “A cumbia from argentina but not the cumbia villera” as he put it (‘cumbia villera’ being the particular urban Argentine form of the music, enjoying immense popularity and artistic flowering in the barrios of Buenos Aires at the moment). Once again it was Axel’s own particular take on the form. It’s truly amazing that just four guys could produce such a fat sound. In fact the whole sound was excellently managed by the engineer, with none of the problems that have dogged the other stages at Womad this year. They also went into tracks such as “(Que Salga) La Fiera”, “Cucaracha” (no, not that one!) followed by “Looking for the Summer Heat” in which the whole crowd starting raving like mad with looks of utter joy and transportation. I looked across at Radio 3’s Lopa Kothari and saw her abandoned to the music too, her face with a smile that would have lit up the whole of Charlton Park on it’s own. This guy deserves to be huge. Simply put, he could rock any crowd, anywhere in the world, regardless of language or culture. You don’t need to be a multi-linguist to understand his music. You just need to love life and laughter. 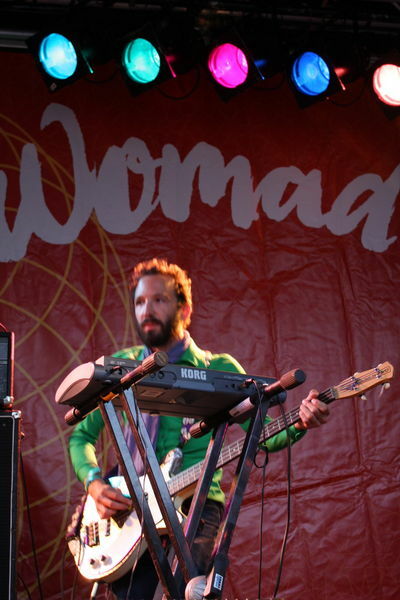 Without any shadow of a doubt Axel Krygier is my surprise Highlight of Womad 2011!